Lake Garda was named after Garda and therefore it is one of the most important cities at Lake Garda. With 4,000 inhabitants Garda is one of the smaller towns at the lake. Tourists like the colourful diversity with beautiful landscapes, romantic spots and a vivid town. This are the three landmarks that characterize Garda. 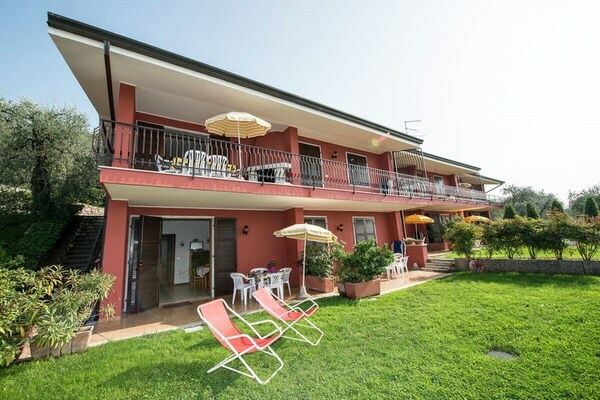 The spacious seafront to Bardolino offers the possibility for ample promenades. From the small harbour ships leave for the other towns at Lake Garda. Right behind the harbour lies the charming old town of Garda with houses in Venetian style, lots of shop, bars and restaurants where you can sit back and relax from your shopping or sightseeing tour. When you like to see some cultural sights you can visit different churches, buildings and places. One church is the parish church Santa Maria Maggiore that was built in the 16th century in Baroque style or the Palazzo dei Capitani und die Villa Canossa from the 18th century. The discovery of old lake dwellings indicates an early settlement in Garda. In the 5th century Garda was mentioned the first time, when the king of the Goth build the Rocca di Garda. The castle is located on a rock, overlooking Garda. But nowadays there are only remains of the castle. The Venetians destroyed it in the 16th century. On the promontory Punta San Vigilio, which is located northern of Garda, is one of the most beautiful beaches at Lake Garda. It is called Baia delle Sirene and is a private beach, but can be used for a fee. On the beach you can enjoy a program for the whole family and some deckchairs. The Mediterranean vegetation with cypress trees, myrtle and oleander gives Garda a special charm and a lovely atmosphere. Villa Ca' Nova is just 300 metres from the lakeside promenade and the centre of Garda. It offers a swimming pool and a panoramic terrace where you can enjoy breakfast. All rooms at this 3-star hotel come with satellite TV and a minibar.